Baby, it’s cold outside! Get ready to warm up with our delicious cherry almond hot chocolate recipe! Tis the season for warm drinks and bonfires, right? I love every minute of winter and the typical things the season brings in. For example, pumpkin spice, flannels, boots, scarves, and the list could go on. As much as I love all those traditional winter things, I am the type to go for something a little different than the norm. I love to switch things up a bit. For example, hot cocoa is delicious but I always feel like there’s something more that can be done with it. I know, how dare I change a perfect hot drink. I assure you, when you start trying new things, you often discover something better. Therefore, I give you cherry almond hot chocolate. It tastes like a chocolate covered cherry, which is another holiday favorite! It doesn’t quite have the sting of a chocolate covered cherry, however, if you like that type of stronger taste, I would double the almond extract. If you like your hot chocolate a little more chocolatey, add a half packet more of hot chocolate and you’ll be in heaven. Without further ado, here’s how you make cherry almond hot chocolate. Don’t forget to print out the recipe card so you can make it whenever you want! 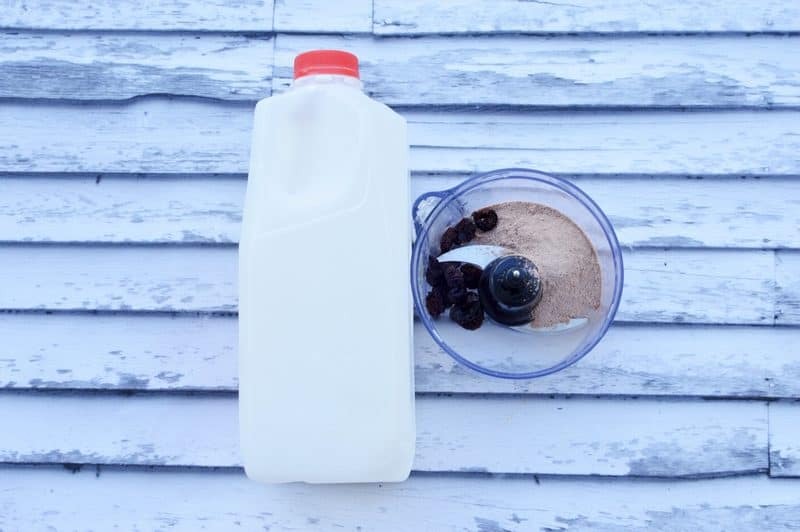 Combine all ingredients in a blender until cherries are finely chopped and no large chunks appear. You may need to stop and stir once or twice to remove any powder from the side of the blender. Place liquid in a mug and place in microwave to heat for about 60 seconds on high. To use the stove, place liquid in a sauce pan and slowly heat on a lower setting being careful to not let it boil too much. For the hot chocolate packet, you can use any kind you want. If you want to keep the recipe relatively inexpensive, go with a brand off the shelf in your grocery store. Swiss Miss is a classic that costs just around $2 a box (sometimes less, depending on which type you get). If you want to get really decadent, you can order a gourmet hot cocoa on Amazon or another online retailer (or find one at a fancy store near you). If you’re trying to cut back on sugar, opt for a sugar-free version. That’s the great thing about using hot cocoa packets in this recipe rather than making the cocoa from scratch, it gives you more wiggle room with your budget, time and diet. Of course, you can make cocoa from scratch if you really want to! Martha Stewart has a good easy hot chocolate mix recipe. It’s basically just sugar and cocoa, although she tosses in a bit of salt, too. Will you try our cherry almond hot chocolate? 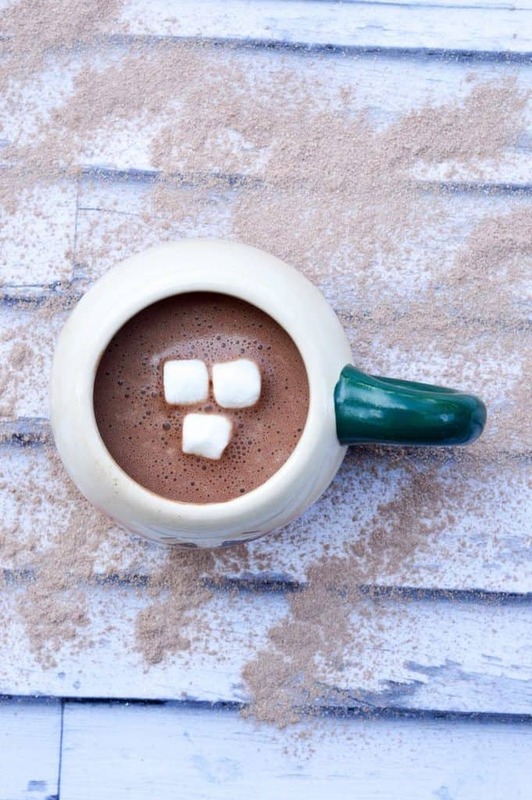 Do you have a favorite hot chocolate recipe? Share in the comments! 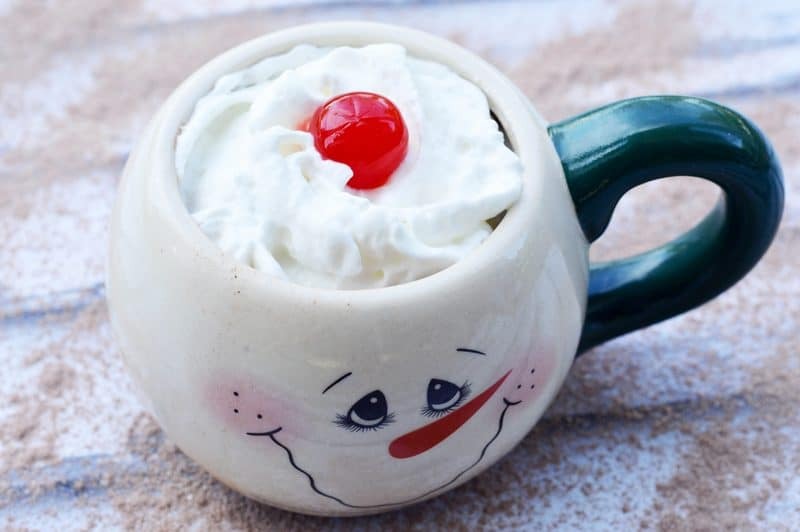 I’ve never had cherry almond hot cocoa, but it sure sounds yummy! Thanks for linking up with Merry Monday last week! This is SO comforting! Would be a perfect partner on a cold day! 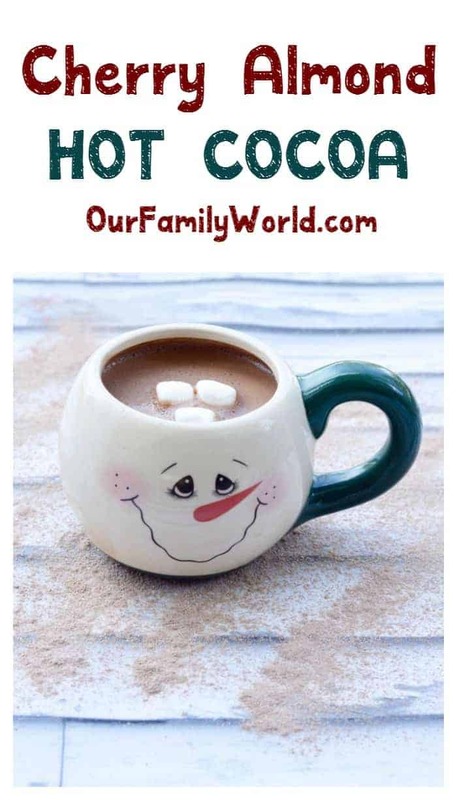 I love hot cocoa, prefer it over coffee and this sounds like a great idea for a hot winter night. Chocolate covered cherry in a cup? Heck yes! This sounds awesome! What a unique twist on hot chocolate. I’d love to try this! Oh my cherry almond hot chocolate sounds amazing. It would be perfect to warm up with after playing outside with the kids. The cherry almond combination sounds very unique. I’m going to have to give this a try! i don’t think I have ever had hot chocolate like this before! It sounds like it would be a nice change from the normal plain chocolate.